Brain: The Inside Story explores the way the human brain works, specifically as it relates to senses (“Your Sensing Brain”), emotions (“Your Emotional Brain”), thinking (“Your Thinking Brain”), how the brain ages (“Your Changing Brain”), and how technological advances may change our brains in the future (“Your 21st Century Brain”). This exhibit highlights the brain’s surprising ability to rewire itself in response to experience, disability or trauma, and showcases new technologies researchers use to study the brain. The FUNdamentals Series 6-week yoga classes is offered to members of the TBI Community and their caregivers for FREE. The series happens 4 times a year–in January, April, July, and October. 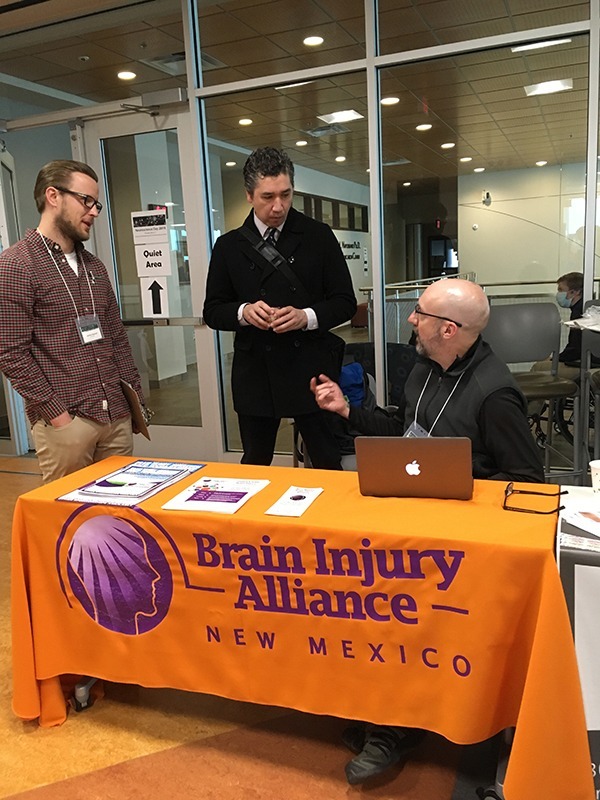 UNM Neuroscience Day provides many opportunities for all participants to share knowledge and expertise around brain health and research. The morning session featured posters regarding cutting-edge neuroscience work by UNM researchers, clinicians, and students. 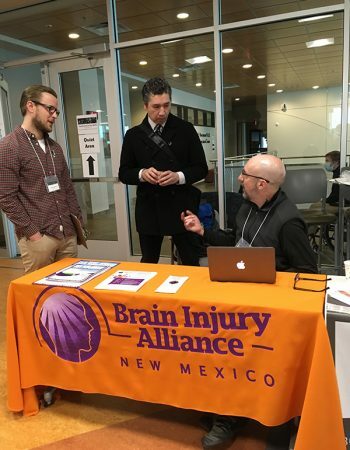 This portion of the day also features many community information tables representing many members of the New Mexico Brain Network (NMBN), and other organizations. This provides an important opportunity for participants and attendees to learn about important resources in New Mexico. 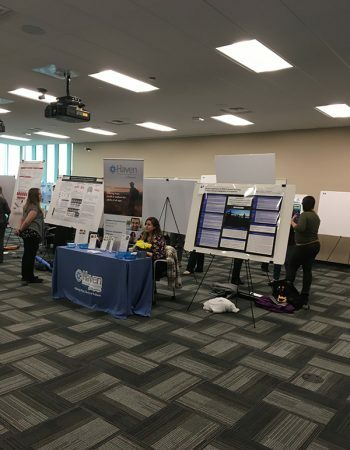 Many attendees participate in a sample of gentle yoga to experience the LoveYourBrain Yoga program. 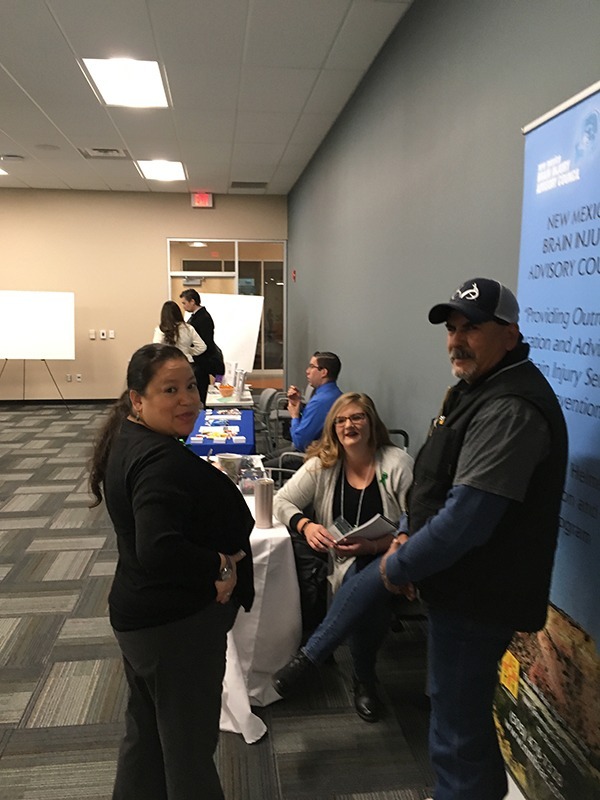 The afternoon session featured a community-oriented discussion, in which representatives from the NMBN each spoke about putting together a brain-oriented fair, focusing on key organizations and services for New Mexicans. Governor Michelle Lujan Grisham signed into law every disability-related bill that was passed in this year’s legislative session. It’s a dramatic change from the last 60-day session in 2017, when then-Governor Martinez vetoed 2/3 of the disability bills we followed that had been passed by the Legislature. 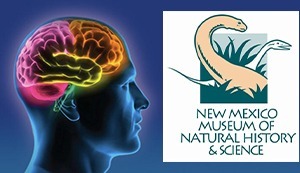 The following bills – Relating to Brain Injury in New Mexico – did not pass in this year’s legislative session..
SB 134 Brain injury fund appropriation. Sen. Jerry Ortiz y Pino. Appropriates $500,000 for the Brain Injury Services fund. SB 171 Brain injury fee increase. Sen. Bill Tallman. Increases from $5.00 to $6.40 the portion of traffic violation fines that goes to support the Brain Injury Services Fund. SB 327 Non-waiver of fine supporting BI fund. Sen. Cliff Pirtle. Requires that if an individual is cited for a traffic violation, the portion of the fine that is earmarked to support the Brain Injury Service Fund (currently $5) cannot be waived, deferred or suspended by a court. An interdisciplinary clinic that includes a pediatrician, physical therapist and rehabilitation psychologist as well as other disciplines and professionals as needed. The clinic currently meets on the 3rd Monday afternoon of each month. To get more information or schedule an appointment call (505) 272-7464. Help build counseling resources for people living with brain injury. Counselors and other health professionals who are interested in learning how to work with individuals living with brain injury in managing cognitive, psychological, and substance use issues can join a group of counselors in the Integrative Cognitive Rehabilitation TeleECHO clinic for free training, case consultation and CME. 2ndand 4thWednesday of each month from 10am to 11-30am at Project ECHO here in Albuquerque or on Zoom.us. There is a significant need for more professionals trained to provide therapy to people living with brain injury.